Climate Change Reconsidered, the 2009 report of the Nongovernmental International Panel on Climate Change (NIPCC), was released on Tuesday, June 2, at a press conference at the Washington Court Hotel in Washington, DC, in conjunction with the Third International Conference on Climate Change. Heartland President Joseph Bast, editor of Climate Change Reconsidered, and authors Craig D. Idso Ph.D. and S. Fred Singer Ph.D. spoke at the press conference. Read the groundbreaking NIPCC report by clicking on the image below. 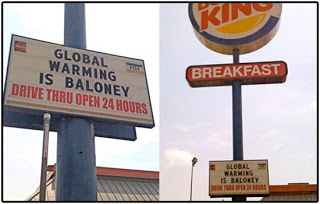 Burger King Stores Promote "Global Warming Is Baloney" Message! A row between the fast food giant Burger King and one of its major franchise owners has erupted over roadside signs proclaiming “global warming is baloney”. The franchisee, a Memphis-based company called the Mirabile Investment Corporation (MIC) that owns more than 40 Burger Kings across Tennessee, Arkansas and Mississippi, has described Burger King as acting “kinda like cockroaches” over the controversy. MIC says it does not believe Burger King has the authority to make it take the signs down. The dispute began to sizzle last week, when a local newspaper reporter in Memphis, Tennessee, noticed the signs outside two restaurants in the city and contacted the corporation to establish if the message represented its official viewpoint. Burger King’s headquarters in Miami said it did not, adding that it had ordered MIC to take the signs down. But a few days later readers of the Memphis paper said they had seen about a dozen Burger King restaurants across the state displaying the signs and that some had yet to be taken down. Media attempts to contact MIC to establish why it was taking an apparently defiant stance were rebuffed, but the Guardian managed to grill MIC’s marketing president, John McNelis. The Guardian sent a transcript of the interview to Susan Robison, Burger King’s vice-president of corporate communications. At one point, a Burger King employee confirmed that the language on the sign was in fact the view represented by Burger King International. We at ilovecarbondioxide.com fully support this grassroots campaign by these Burger King franchisees and highly encourage you to support the chain and its efforts in this matter. Posted on June 6, 2009 January 20, 2018 Tags NewsLeave a comment on Burger King Stores Promote "Global Warming Is Baloney" Message! Not too long ago, global warming activism in the U.S. Capitol made some sort of carbon cap-and-trade legislation seem like a near certainty. But the tide may be turning. According to Sen. James Inhofe, R-Okla., the ranking Republican of the Senate Environment and Public Works committee, a key committee needed for passage of a cap-and-trade bill, the trend indicates it can’t pass, at least in the U.S. Senate. He explained that the House, under the leadership of Speaker of the House Nancy Pelosi, will pass anything, but it takes both houses of Congress for it to become law. One possibility some have suggested is that the Environmental Protection Agency would impose cap-and-trade regulations under the Clean Air Act, a law that gives the EPA authority to regulate pollution in the name of protecting the nation’s air quality. That according to Inhofe can be stalled until President Barack Obama leaves office. But, the key component of the legislative process under these circumstances would be the U.S. Senate. Inhofe pointed to a measure that would require any climate treaty to include developing nations to self-impose the carbon restrictions for the United States to also go along with it. Inhofe explained that in 2003 and 2005, he was able to nearly single-handedly take down a bill sponsored by Sens. John McCain, R-Ariz., and Joseph Liebermann, I-Conn., which would have set a cap-and-trade system in place. But, in 2008 with a similar bill sponsored by Sens. Liebermann and John Warner, R-Va., he had gained significant support compared to his 2003 and 2005 efforts, showing a trend that passage of this type of bill is becoming increasingly more difficult. The Oklahoma senator credited the Founding Fathers, noting that the senate rules put in place are a difficult obstacle for the global warming activists in the federal government to overcome. Perhaps Al’s green economy refers only to the green he’s pulling in from his ‘make carbon evil’ scam. Bada bing, hold the presses, Al might have some new entries to the carbon trading business soon, and dese guys is tough competition, if ya know what I mean. Should the mob get into the green agenda, the odd thing is that they will be some of the most honest people in the entire scheme; but they recognize a criminal shakedown when they see one. Maybe they’ll make Al an offer he can’t refuse. Is Al bitter? He spent $300 million on promotion for his ‘climate crisis’ and got exactly nowhere with the American public. Is it a coincidence that he’s threatening the advertising industry? He says that Current TV is the future, and of course he owns Current, although last we heard, things weren’t so rosy over there. Canada’s perennial hippie, David Suzuki, says we need to take care of the oceans, or we might end up sleeping with the fishes. My least favorite Royal, the man who divorced the model so he could marry his horse, calls for squirrel genocide. Don’t squirrels have rights too, Prince? Part Two: AGW Scaremongers It’s bad enough that Greens want to mess with taxes and the way ordinary people live, but some are pushing for drastic projects called geo-engineering. Fortunately, not even Obama’s scaremonger thinks it’s time for the crazies to take over yet. One example of geo-engineering is to put large mirrors in the sky. Is there no end to the narcissism of the greens? Grilling without guilt, can it be done? President of the Planet Obama showed the world how he really cares about the environment by taking the First Klingon to NYC to catch a show. I’m not certain, but I think it’s the first campaign promise he’s kept. CLICK ON OVER TO THE DB TO READ THE REST AND CHECK OUT THIS WEEKS GLOBAL HOTTIE! CENTRALIA — Congressman Blaine Luetkemeyer doubts that human activity is causing global warming and opposes a bill approved this month by the House Energy and Commerce Committee that would cut pollution by limiting heat-trapping emissions. Luetkemeyer, a Republican from St. Elizabeth, told two dozen Kiwanis Club members yesterday that a carbon tax that would be imposed as part of the bill would cost an average Missouri family about $4,000 a year. He based his calculation on the fact that coal-fired power plants produce about 85 percent of the energy consumed in Missouri, and he said utility executives had told him rates will increase by 50 percent to 150 percent per year.Republicans have been saying the bill will cost $3,928 per household, using numbers generated by Massachusetts Institute of Technology Professor John Reilly. The computation, which is in dispute, takes into account all factors in which energy costs would affect lifestyles and livelihoods. “It’s a huge, huge tax on everybody,” the Ninth District congressman said. “This tax affects everybody, especially the poor and people on fixed incomes.”Keven Kennedy, spokesman for Repower America-Alliance for Climate Protection, said Reilly disputes the way Republicans have used his figures and has written a letter to the House Republican leadership saying the figure was “totally mischaracterized.” Kennedy said Republicans were using fear tactics.“This package considered by Congress will have a direct effect on the creation of 43,000 new jobs in Missouri,” Kennedy said.The American Clean Energy and Security Act would establish a “cap-and-trade” emissions market, promote energy efficiency in homes and businesses and encourage energy independence. Luetkemeyer said there is no need for it. Companies: After an all-out war on oil companies from the left in recent years, it bodes well for the future to see Big Oil now recognizing the attack it’s under and its duty to fight back. Witness Chevron and Exxon Mobil. Shareholder meetings can be pro forma affairs, but not for major oil companies, which have become a lightning rod for the anti-corporate sentiment gaining traction in U.S. political life since around 2006. Wednesday, Chevron was descended upon by a zoo-full of San Francisco leftists pushing rain forest sentimentalism, Burma, and other pet causes dear to the no-soap crowd. They journeyed all the way to San Ramon, Calif. to shout “Shame on you!” and “No blood for oil” and worse yet to make demands on the company. Among them, a vociferous crew calling on Chevron to settle quickly with an Ecuadorean activist group with a guerrilla-like name: El Frente de Defensa de la Amazonia. El Frente has a $27 billion pollution lawsuit against Chevron. Its case is worthless. Chevron hasn’t operated in Ecuador since 1992 and got a clean bill of health from Ecuador in 1998. Any pollution now is a product of Ecuador’s mismanaged state oil company. But that hasn’t stopped the formidable publicity machine that’s roped in the gullible media covering this case. The new demand, echoed in the press, is for Chevron to “settle” with El Frente. Meanwhile, over at Exxon Mobil, the issue is why the company can’t go “green.” Another throng of activists tried to coax the company into scrapping its global leadership in oil production and instead to turn itself into genteel green farmers, tending corn and sugar and switchgrass in the name of biofuels. But in both cases, something happened this time at the corporate meetings: The companies sharply rebuked these nonbusiness interests. It was a dramatic shift from the polite courtesies and kowtowings they’ve extended to these radicals in the past. This time, they actually stood up for themselves and what they do. Chevron’s CEO bluntly told the radicals from “True Cost Of Chevron” that their waved-around propaganda “report” on the oil giant is so shoddy and false it actually “deserves the trash can.” Exxon Mobil’s Chairman and CEO informed other radicals that oil and gas will continue to be dominant fuels, meeting some two-thirds of global energy needs until at least 2030. As such, it makes no sense whatever for Exxon to go into some other industry. Better still, the shareholders of these companies smacked down every resolution designed to make the crazies feel good and the value of the companies go down. Maybe that’s because these moves look like shakedowns in search of a payday. Chevron’s being sued by a registered nongovernment organization (NGO) in Ecuador, so its financing is a black box. Its lawsuit is reportedly paid for by trial lawyers in Philadelphia, a group not exactly known for respecting shareholder value. But who knows? Exxon is beset by several groups that at least one shareholder thinks are tied to unions and activists: “Resolutions to do things like . . . pursue renewables are really just attempts by environmentalists and unions to gain control of the company to advance various public-policy goals,” Steven Milloy, managing partner at Action Fund Management, told Bloomberg News. “At the top of that list is climate change.” Milloy should know: He’s also publisher of the popular JunkScience.com Web site. The real aim of all these attacks is to end these companies’ world leadership in oil extraction. The green groups want to put an end to what the oil companies do best, from finding oil in the world’s most hostile climates like the Arctic Sea, to extracting oil from abandoned wells, to drilling oil 12 miles through salt walls under the sea. The ultimate goal is less oil to power American industry and to maintain the quality of private life. It looks like a new era is upon us. The push-back to defend our way of life has begun. Ice caps and glaciers growing around the world, penguins looking for warmth! 30 years later, Arctic and Antarctic ice has actually increased, and is growing at fastest rate in recorded history. Next time you see the news reports of “catastrophic” ice loss at the poles, try to remember you’re watching a ratings-oriented entertainment program driven by hysteria and propaganda. 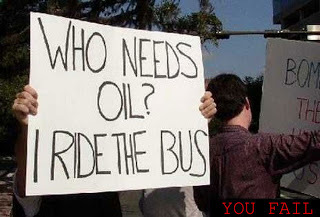 Ditto for the Greenpeace rallies chock full of ‘climate change’ propaganda to secure their funding. 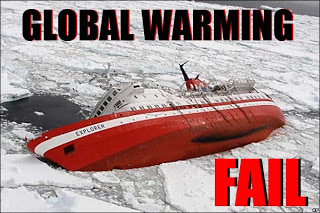 Ditto for Al Gore’s un-scientific Star Trek film, now proven to be bursting with junk science. Now, check the facts for yourself. Why do we continue to hear the scare stories about Antarctic ice vanishing when it is, in fact, breaking records for ice growth? Well, it’s simple. Your local media outlet always shows you seemingly amazing images of massive melting and chunks of ice breaking away — but always neglect to mention that it is normal, and happens every single year during the spring/summer melt. Oh, and it’s been happening since forever began, by the way. Be aware when they show the “before” and “after” pictures on your 6 o’clock news. The “before” pictures are always from the winter season and the “after” are summer images. So, to properly educate you, take a look at actual images of ice concentrations from the same time of year in comparison, spread out over three decades. Not only is the interior growing but so is the sea ice. Sea ice levels are higher now than when satellite records began. Note that the ice extent for October 1979 (when satellite measurements began) is 18 million sq km, for October 2008 the ice extent was 18.1 million sq km. Ice concentration shows even greater increases, from 13.6 million sq km, to 13.9 million. The Antarctic penguins must not be enjoying all of this cold and ice too much as hundreds, perhaps thousands, are migrating to the warm beaches of Brazil. More than they’ve ever seen. Hey, wouldn’t you migrate to Brazil if you lived in Antarctica and it started getting even colder than normal?!? HERE’S SOME MORE REALLY FUN STUFF YOU PROBABLY WON’T SEE ON THE NEWS! 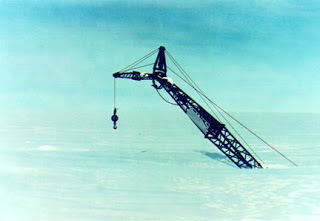 In the mid 1960s, ITT built a power transmission line in Antarctica. The transmission towers stood 115 feet tall. As you can see in this photo, all but the top 30 feet of the towers are now buried in ice. Worldwide glaciers growing….but heaven forbid the media will inform you of this fact. in the continental U.S. that are growing,” the article says. are growing on Washington’s Mount Shuksan. in Alaska that are advancing a third of a mile per year! How convenient. Let’s make sure to study only the ones that are retreating. And forget to mention that it’s normal for them to retreat, while others grow. Musta learned that trick from Al Gore himself. ice on its flanks could be gone by 2100,” the article continues. going to be gone by 2100? glaciers put together, which means that 90 percent of the world’s glaciers are growing. Please let your local news sources and Greenpeace activists know that you don’t appreciate the kind of disinformation they keep shoving down our throats. Eh? Not everyone has the time to go out and research the actual facts for themselves! This concludes my weekly LOL in Al Gore’s face. Posted on January 14, 2009 January 20, 2018 Tags News12 Comments on Ice caps and glaciers growing around the world, penguins looking for warmth!